My absolute favorite snack (especially when I am dieting/trying to lose weight) is dried fruit! I pretty much love dried fruit of all kinds - they are sweet and are a great source of fiber to keep me full longer! 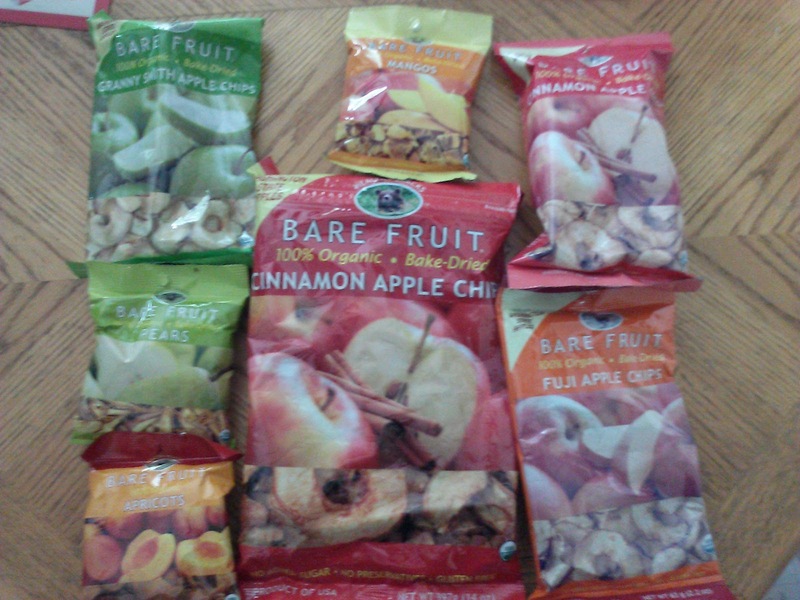 So when I saw the great selection of organic dried fruit from Bare Fruit Snacks, I was so excited to try them and add them to my snack routine! There are really several types of snacks on the market. Some are great tasting. Potato chips really do taste good. But they aren’t good for you. Some snacks are “better-for-you.” But there are very few “good-for-you” snacks out there. An apple chip, baked (not fried or freeze-dried) tastes great while still being good-for-you in every way. Bare Fruit Snacks are all-natural and the organic chips are certified by Washington State, the hardest organic certifiers in the country. They make every effort to be environmentally friendly and will be 100% carbon neutral in 2013. What makes them special is their exclusive process that bakes the chip in a way that the natural sugars caramelize on the outside. This provides a sweet and tart flavor combination without adding sugars or flavors. Plus, in some of their products they add organic cinnamon and other natural flavors to provide a variety to customers. Basically, Bare Fruit Apple Chips are the perfect snack: great tasting and great for you. Made from Washington State apples (and nothing else) our apple chips are low in calories, fat free, full of fiber, and so good even your kids will love them. Just like eating an apple, only more convenient and even tastier. If you like to snack on fruit but want an easy on-the-go snack or you are looking for a healthier snack for your busy day, look no further than Bare Fruit Snacks! They are delicious, will give a great crunch, and are so good for you! Buy It: You can purchase all Bare Fruit Snacks from the Bare Fruit Snacks online store. Win It: Bare Fruit Snacks is generously offering (1) Case of Bare Fruit Snacks to a lucky winner!